Photo: In addition to supplying nutritious ingredients for our children’s meals, our farm also provides employment opportunities for local impoverished villagers. 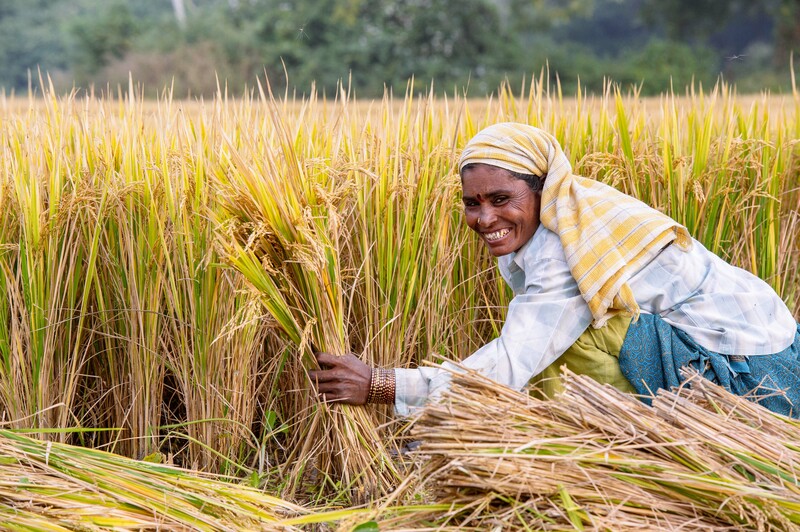 We are happy to report that we harvested 4.6 tons of rice this month at our new rice farm. We will use the rice for the children’s meals, realizing a savings of about $2,800 we would have spent to buy the same amount in the market. It may not seem like much, but in India, that’s 4.5 years’ worth of average annual income. Though our rice farm covers 5 acres of land, we were only able to cultivate 3 acres of rice due to adverse weather conditions this season. However, it was still a successful harvest, and we are preparing our land for the next rice planting season in June. We are also planning to drill a new well at our farmland to improve irrigation, to help keep the land cultivated for growing vegetables before the rice planting season. In addition, we purchased some excellent soil to aid the growing of our on-campus gardening projects which are yielding produce such as eggplant, tomatoes, green chilies, curry leaves, and beans. We hope to draw more profits from the gardens, and we are thankful that the harvests of organic vegetables from both the ground level gardens and the rooftop gardens can also be used in the children’s meals. In other good news, we are adding a second level to our Children’s Hope Center in Hyderabad, India — construction should be completed in March or April. Previously we were using the existing ground floor and its two small rooms for a study hall and a computer lab. It’s been a bit crowded for the 40 children enrolled this year as we’ve been trying to use the same study hall for preparing and serving meals. The additional second level will become the study room which will give the children a more comfortable and peaceful environment to do their studies and excel in their education. 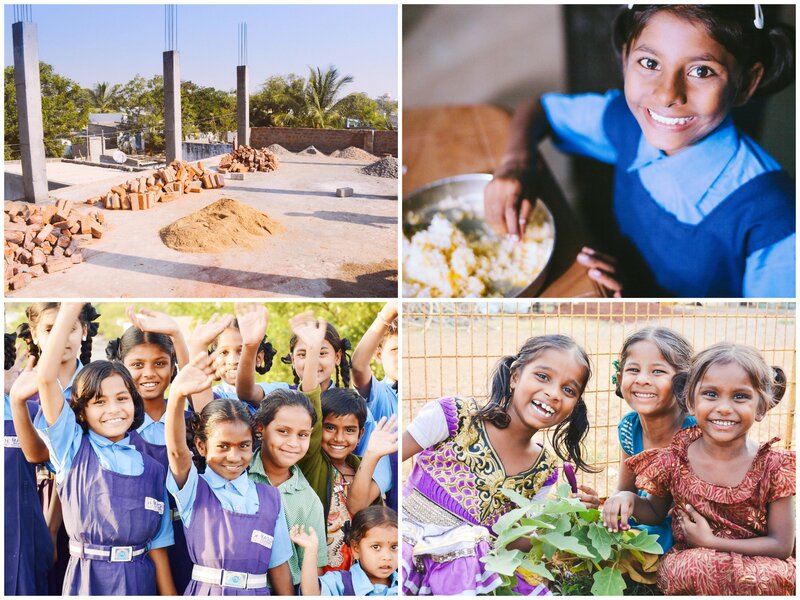 Photo inset: (Top-left): Construction has begun on the second level of our Children’s Hope Center in Hyderabad. (Top-right): Rice harvested from our farmland is used to feed the children at our Boys and Girls Homes. (Bottom-left): Girls who benefit from our Children’s Hope Center program in Hyderabad are thankful to have the opportunity for an education. (Bottom-right): These girls from our orphan home are excited about what’s growing in our ground level garden. Construction is also underway for an on-campus high school at our main campus, which should be completed by the end of May. We decided to start a high school on our campus because our children have to travel very far to attend higher classes, sometimes the girls struggle with social problems, and our children are treated carelessly because they come from families below the standard poverty line — they are of the lower castes and Dalits (outside of the caste system, “untouchables”). They are considered to be the lowest people in the society, so we want to encourage them, love them, and display their talents to the society, as well as give them sufficient care and protection. There is no high school in this area, so we also hope to offer our high school to the public — not just our orphans living on campus. We are extremely grateful for your prayers and for your faithful support, and we look forward to reporting back with our progress in improving the lives of these children.